Record-Breaking drop for RAF A400M Atlas. A Royal Air Force Atlas (A400M) has delivered a cargo load weighing 23 tonnes by parachute over Salisbury Plain in a record-breaking test of the transport aircraft’s next-generation capabilities. 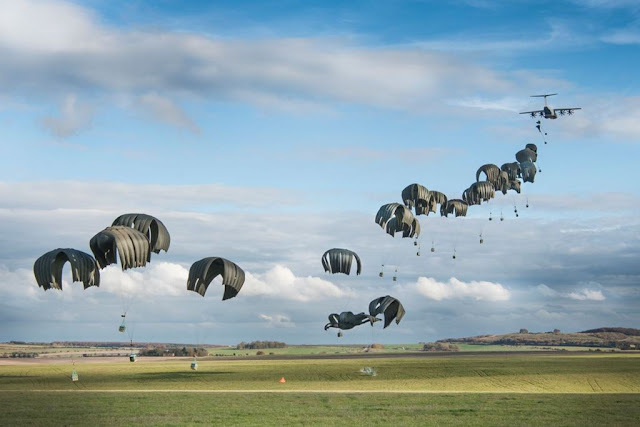 The drops, representing the heaviest overall load ever air-dropped by a UK aircraft, took place as part of trial to confirm Atlas’ ability to deliver heavy loads, such as military equipment, supplies and humanitarian aid, without needing to land. The trials were overseen by the Defence Equipment and Support (DE&S) in partnership with the RAF, the Joint Air Delivery Test and Evaluation Unit and Air Warfare Centre, QinetiQ and Airbus. Results from the trial, which took place on 6th November, will now be fed back into the Atlas development programme which is qualifying the aircraft to perform such operations in active RAF service. By comparison, the maximum cargo weight deliverable via the Container Delivery System from a C-130J Hercules is approximately 15 tonnes. The UK’s Atlas fleet is being developed to complement the Hercules fleet in support of transport operations all over the world. Atlas trials are undertaken by 206 Squadron which is based at RAF Brize Norton alongside front line squadrons XXIV and LXX Sqns. The international Atlas programme, being delivered by Airbus, is supporting around 8,000 jobs in the UK. In total the UK RAF will receive 22 Atlas aircraft which are all expected to be delivered by the early 2020s.